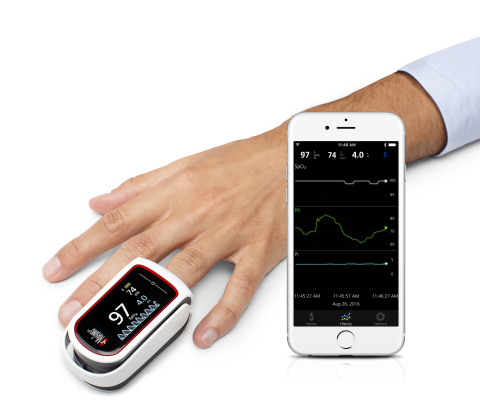 Masimo has announced that its MightySat fingertip pulse oximeter can now be purchased from Apple.com and select Apple retail locations in the U.S. and Canada. The pulse oximeter provides noninvasive measurements of oxygen saturation, pulse rate, and perfusion index, allegedly with greater accuracy than over a dozen other hospital-grade pulse oximeters. In a study of 70 healthy volunteers during conditions of movement and low blood flow, Masimo SET was the most accurate pulse oximeter when compared to 19 other hospital-grade pulse oximeters. SpO2 accuracy was defined as being within 7% of the reference value and pulse rate accuracy as being within 10%. The measurements and trends are sent to iPhone or iPad via Bluetooth LE and stored in the Masimo Personal Health app available in the App Store, while the data can also be shared with Apple's official Health app if permission is granted. MightySat is $299, while a premium version that also measures respiration rate and pleth variability index is available for $399. I've always thought that Star Trek gives us the vision and human ingenuity will eventually give us the means. I'd like to see Foreflight and other aviation EFB's be able to display this info on screen. For me, having this, along with blood sugar on 2-3 second intervals, with color coding would be good for pilots. * For blood sugars over 75 mg (4.2 mmol): Accurate within 20%. For example, if your blood sugar is 200 mg (11 mmol), the meter must read between 160 (8.8 mmol) and 240 (13.3 mmol) at least 95% of the time. * For blood sugars under 75 mg (4.2 mmol): Accurate within 15 mg. For example, if your blood sugar is 60 mg (3.3 mmol), the meter must read between 45 (2.5 mmol) and 75 (4.2 mmol) at least 95% of the time. Yep... if you're at 75, you could be at 65 mg/dl or 90 mg/dl, but honestly, for me, they're pretty tight, not at the extremes. It's just the panic of the OMG! These can be off and KILL YOU! 7% off target could end up being a problem couldn't it? Is it conceivable that a future Apple Watch can read (by itself) via sensors on your wrist under the watch blood pressure and body hydration levels? Absolutely it is! This sort of thing is only a matter of time. Whether it will be decades or not is a different matter. Uh you don't need bluetooth if your not using your phone. Thanks. Just the bog standard readers we have currently. It would be nice to have things automatically logged to your phone/tablet/desktop with graphs created on the fly to spot trends, rather than taking manual readings. Especially if taking readings is a regular occurrence. The Masimo is certainly pricey, but for those that need it could be worth it. The Apple Watch already has a pulse oximeter, but it's not enabled, likely because of the huge delay/effort needed for FDA approval. The FDA's not wrong to test and regulate vital medical devices, and Apple certainly could not delay EVERY Apple Watch generation over that one feature. But it's a shame it can't happen quicker. Top of the wrist is not a great place for gathering SpO2 data through reflectance, which I suspect Apple found out. Yes, it appears that there are some extra LEDs and sensors in there, but that alone doesn't make a pulse oximeter. So, I wouldn't jump on the FDA. Nor is the FDA approval process all that horrible. Source: I worked on SpO2 devices when they were first coming out, participated in FDA data collection and clinicals. There's a reason why the fingertip sensors are still dominant - they work. O2 sats error limits of 7%..?!! That's appalling, and renders this a toy if true.